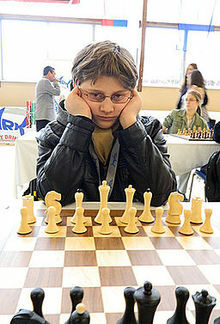 Samuel Sevian (born December 26, 2000) is an American chess prodigy. He was born in Corning, New York. He holds the record for the youngest ever United States Grandmaster at the age of 13 years, 10 months, and 27 days. He also holds the record for the youngest ever United States International Master at 12 years and 10 months He has also broken age records when reaching the National Expert and Master titles. Sevian was World Champion for U12s in 2012. Sevian was born to Armenian-born parents. His father, Armen, with PhD in Physics works as a laser scientist. He has a younger sister named Isabelle. Sevian started to play chess when he was 5. His first success came when he became the youngest Expert in USCF history at 8 years, 2 months, beating Brian Luo's previous record by over 10 months, an achievement that was featured in an article in the Los Angeles Times by International Master Alexiou Koutsoudis. On December 9, 2010, Sevian became the youngest National Master in USCF history at 9 years, 11 months, and 23 days, beating Nicholas Nip's record by 3 days. In 2012, Sevian completed all International Master norms in the space of 6 months, during three Metropolitan FIDE IM Invitational events. He eventually became an International Master after crossing the 2400 FIDE rating mark during a tournament in Budapest in November 2013, setting a new US record of 12 years 10 months. He became the World Champion in the U12 category in Maribor, Slovenia, November 7-19, 2012. In May 2013, Sevian was invited to play in the U.S. Chess Championship in St. Louis as the youngest ever participant. The field consisted of 24 players and Sevian scored 4/9, which placed him in shared 14th place ahead of several grandmasters. Sevian became a Grandmaster at 13 years, 10 months, and 27 days, a new US record. After completing GM Norms at the Foxwoods Open in January, Saint Louis GM Invitational in May and Washington International in August 2014, he completed the requirements for the title by achieving a 2500 FIDE rating during the Saint Louis GM Norm Invitational tournament, which he won with 7.5/9. He took part in the Tata Steel Challengers event in January 2015, sharing fifth and sixth with 7.5/13 points. Sevian shared fifth place in the US Chess Championships, beating Wesley So, a world top ten ranked player, and drawing with Hikaru Nakamura as well as defending champion Gata Kamsky. This performance earned him a spot in the 2015 Chess World Cup. He drew both classical games against Teimour Radjabov 1:1 in the first match of the World Cup but got eliminated in the rapid play off 2:0. He played a 2-game exhibition match against GM Nils Grandelius in January of 2016.